I believe very much in the creative process. It is great sometimes to sit down and doodle and just throw something down...but if the inkling of an idea is there that initial idea or drawing can be refined and much improved upon. And in real life it helps to get things right for the client as well as to make changes from certain points...as well as avoiding costly mistakes. So even 'fun relaxing drawing/painting/modeling' is often a spring board to a great project that can be refined. As mentioned previously, I had decided to do a Godzilla pic because my son enjoys him so much adn I do pics for their school every year. At the bowling alley between frames (I have a paltry 133 average and shoot anywhere from a 205 to an 90 depending on what crazy back or gym soreness issues I am dealing with the night of...in case you were wondering just how bad I sucked...)I was doodling on the back of a flyer with an intitial pic I had in my head. I had originally wanted to do a painting in Photoshop since it had been a while since I had done that technique. I still have it pictured in my mind...but after seeing Chris Leavens turtle I decided to go Vector. Originally I wanted to have Godzilla fighting Ghidora...and if you don't know who that is...well I probably don't blame you. 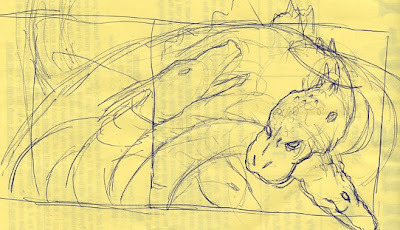 I did several small sketches trying to figure the layout out. From these sketches I tried to do a bigger rough and get a feel for what the characters were going to look like. I had reference pics but wanted to update the looks of the monsters. What fun is it to just copy a picture someone else has already done verbatim? 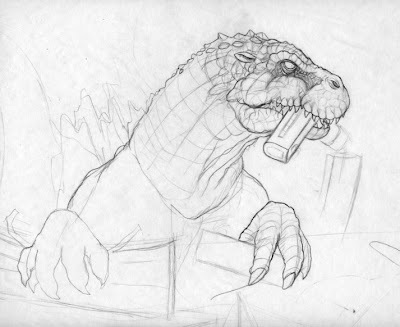 After sketching this out I started looking through some reference pics and saw a still from the original Godzilla where he had a train hanging out of his mouth. At that point I decided to hearken back to the original less cheese filled story lines. 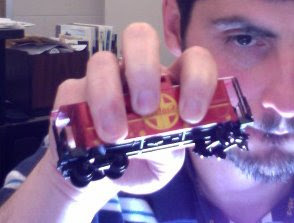 So I decided on adding in more of original feel with Zeros and a train being pulled apart. Since this was still a rough I tried to balance out being detailed enough to know what was going on but also to realize I had to fix some things in the next step...particularly the muzzle. The original Godzilla and many designs there after tended to blend facial characteristics of dinosaurs with canine or feline features. 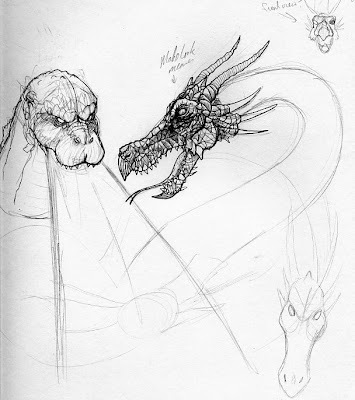 If you look at a lot of Eastern dragon drawings they have such notable characteristics so it seems to make sense that this 'dragon' would also retain that. I however wanted to push more into the traditional dinosaur look. 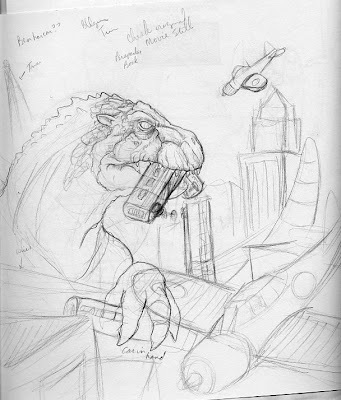 As stated in an earlier post, it isn't always easy to walk the balance of taking a well-known design and changing it enough to be different but no so much that it alienates the fan base...the American Godzilla was a neat design but was too far off and caused a lot of waves. Once the rendering was done I collected reference pictures for both the train and planes. It took a lot of searching to get a plane at the right angle (since I didn't have a model laying around) and a student brought in a train that I could modify while doing the drawing. One thing I am painfully slow at is anything mechanical. It takes me forever to get the detailing correct and is much less forgiving if an angle is off or a line is wrong. Because I was going to be doing this in the vector program I took pictures at the correct angle and planned on just using them with not doing too much in the way of pencil work. In response to your comment...that certainly would be a scary road to take. It is cool to see all the prep work that went into this. Many time, good illustrations are like painting or cooking; it is all about the prep work. I also enjoyed the MeMe. Nice breakdown of your process. Your finished Godzilla piece turned out great. I could tell you put a lot of work into it, but I had no idea just how much. I am in complete agreement with you with regards to tracing. There are too many "artists" using digital tools, tracing photos, slapping a few high-contrast gradients on their work and calling it their own. Tracing YOUR OWN drawings isn't really a big deal, in my opinion and a lot of artists tend to rough sketch their work, scan it, and trace and color it using Photoshop, Illustrator, or Freehand. Personally, I'm a consummate non-tracer, maybe to a fault. I draw everything in Illustrator, start to finish. Anyway, it's great to see the stages of your work and how you refined your illustration over time. I've toyed with the idea of posting a breakdown of my process and after reading your overview of your own, I'll probably do so in the near future. I have a weakness for half done illos or sketches in process:all viewers can imaginary complete the image acording to their own desires,this ''open fields''like words or stories half said are really appealing.I really like your work!